Pivot app is one of the biggest Chinese community which is directly funded by big companies such as Binance labs, Huobi, INBlockchain etc. Just sign up with your Gmail account and then download the Pivot app to withdraw coins. It is basically a news or article writing an application. Then earn free Bitcoin daily. Big companies like Binance labs, Huobi, INBlockchain etc. have invested on this Pivot app, which makes this app trustworthy. This application is available on both Google Play Store and Apple Store. Both users of Android as well as iOS can earn free bitcoins daily. Click here to download Pivot app. After clicking the link you will be directed to Play Store or Apple Store. Then download the application on your mobile and sign up with your Gmail account. You will see the dashboard, on the bottom right corner click on the icon (profile icon). Go to your profile and check the stats. 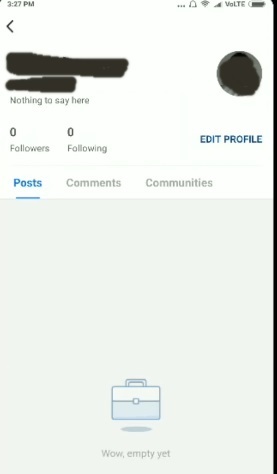 There you will see 0 followers and 0 following. Below on the dashboard, it is clearly written there that you can earn up to 4 BTC. Then go upwards and click on your profile, you will be redirected to the new interface and there you will find blank space, you do not have any posts, comments, and communities at present. 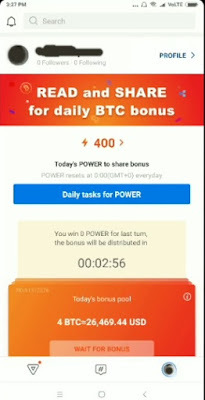 Go back to the Pivot app home page and at the bottom left corner you can see the triangle icon, click on that to earn free BTC. 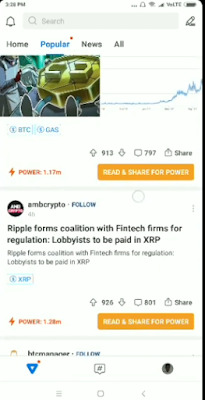 Click on the blue triangle and then you will see the listed number of articles click anyone and after scrolling down you will see 2 options “get read power” and “share for power.” You can read the whole article or not. Click on “get read power” and you will get power or points (100). Then you click on share, you can share on WhatsApp, telegram, Gmail etc. again you will get points (100). You can read at the max 20 posts daily. Your power gets converted to Bitcoin at midnight or after 12:00 AM. After that, your power will reset to zero and your Bitcoins will be sent to your wallet in 10 hours and then you can withdraw to your Blockchain. Also MUST read FAQ section under the Popular tab. 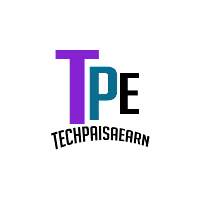 There you will see all the rules and other features regarding Pivot application. 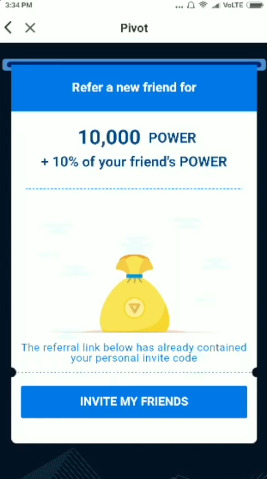 Pivot app gives the opportunity to invite a friend and to get more power that is 10,000 points. If that friend of yours earns any power you will get 10% of that power. Click on your profile go to the bottom, there you will see the option of refer or invite a friend, click on it. Then you will be directed to referral page, click on “invite my friends “ and you will get your referral link. Another method of earning is by writing an article or asking a question. 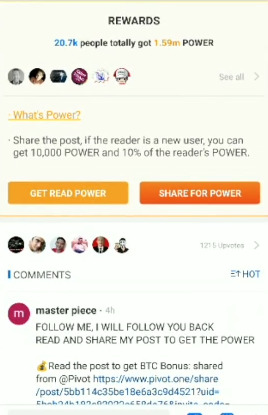 If people like your post and it gets upvote then your power will increase thus resulting increase in power. Warning: Do not make multiple accounts on Pivot app to earn free bitcoin, do not spam by writing again and again, do not share your link like a spammer, share it when you are almost assured that users will download the app. Pivot app is very strict, they will ban you immediately if you apply any tricks. 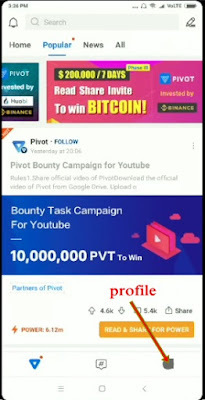 Review and Conclusion: Pivot app offers you a big opportunity to earn free bitcoin daily. It is a genuine application which is available on Play Store as well as Apple store, but friends these type of applications no matter how trustworthy they are but will only give you short time good income, cause when the users increases they might decrease the power or points, then it’s like licking a droplet from the river. So, take benefit as soon as possible. Concentrate on Referrals. I have written an article on how to share links, read the article and do the referring if you do not have enough friends.